Trapping is a good method for dealing with many nuisance wildlife animals, such as raccoons, opossums, etc. So it's natural to think that if you want to get rid of bats, you should trap the in some sort of trap. 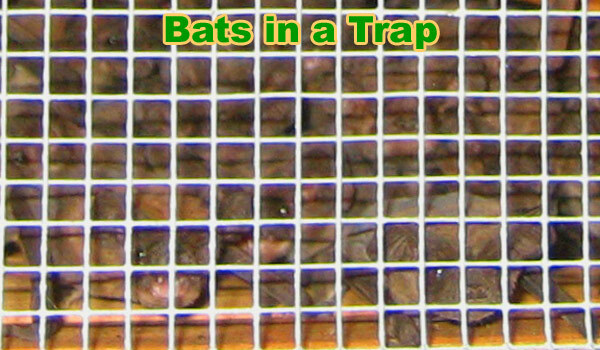 However, bats are different, and there is no place for traps when it comes to bat control. It's so much easier to simply exclude them from the building! Read my home page for full information on exclusions. I'll examine some of the methods for bat trapping below, so you can understand why traps aren't the right type of tool for bat removal - they're inefficient, inhumane, and just plain ineffective! 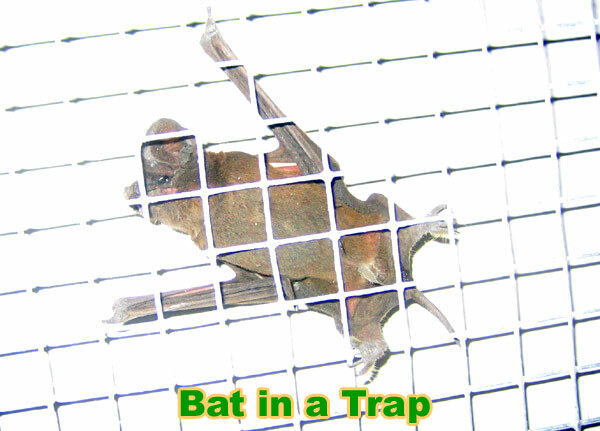 Some people use specially modified cage traps or boxes mounted on the bat exit points, that gather them as they come out, and some people also try catching the bats with nets affixed to the exit points and then they put the bats in a container. This of course leads to the problem of what to do with the bats after you’ve trapped them. It is illegal to kill bats, as they are a protected species. If you release the bats outside, they are going to come back in if you haven’t properly sealed off your home. Even if you drive the bats a long distance and release them, they will eventually be back. Bats can find their roosts from as far away as five hundred miles. You do have to make sure, in any bat control job, that all the bat entry points are found and closed shut. Read my bat prevention or repairs pages for instructions on how to bat-proof your building. Other bat trapping methods include homemade and commercial traps, where the bat enters the trap and the door closes on it. Since there is a minimum of 40 bats in a colony, you will need a lot of traps, or you will need to reuse the few you may have many, many times before trapping all of the bats. As with netting, you still have to figure out what to do with the bats once they’re trapped. Glue Board Bat Trapping Methods - People who have bats in their homes and don't know the proper way to remove them try many methods for trapping them. Sometimes people will take glue boards and place them in the attic where the bats are roosting. A few of the bats (a small % of the total) get stuck to the glue boards and they eventually starve to death. This is illegal and incredibly inhumane. This is a slow and smelly process, as it will take many boards to get all of the bats in the colony, which number a minimum of around 40, and you have to deal with the decaying bodies. What a horrible approach! Here is my bat exclusion guide, which contains more info than a rookie should know, because of the complications with do-it-yourself jobs. There are many reasons why bat-trapping methods do not work. For one, it is a dangerous procedure. If you are not experienced with trapping bats, it is quite possible that you could be bitten by one. Although bats are not aggressive, if you are trying to trap them, they might become defensive. Bats can carry rabies, which is a virus that can cause brain inflammation that can result in death. If you are bitten, you will need to begin rabies treatments immediately. Even if you can catch the bat that bit you, by the time the bat is tested to determine if it has rabies, you could already be dying. Another health concern when trying to trap bats is the large amount of guano, or waste, they produce. A fungus called histoplasma encapsulatum is carried in bat guano. The fungus contains tiny airborne spores, and if inhaled, these spores can cause a disease. The disease is histoplasmosis and histoplasmosis is an infection of the lungs. Although it is not always serious, it can require treatment. Particularly with people who have weakened immune systems or a chronic lung disease, such as bronchitis or emphysema. Histoplasmosis can spread infection throughout the body, and it can be fatal. The only safe and legal way to remove bats from your home is by a method called live bat exclusion. You can choose a wildlife removal expert that will come to your house and install exclusion devices on all of the bats’ entry points or you may want to try it yourself. The exclusion devices come in many forms, but each is designed to allow the bats to exit safely through the device. The exits are one-way, however, so the bats cannot get back in through the device. After a few days, once all of the bats have exited through the device, the house can be sealed to prevent their re-entry. Sealing the house is a very important part of the bat removal process. If you get them out, but you don’t seal up all of their potential entry points, then they will definitely return. Entry points are always high on the house, typically around the roof. Bats can get in through cracks as small as 3/8 of an inch, so your home will need to be checked thoroughly for entry points. Typical bat entry points include gaps where the chimney meets the roof, gaps in eaves, and loose fascia boards. They also get in through louvers, vents, and ridge caps. Warped boards or sidings are other potential areas where bats could access your home. Any area of your home that is damaged, such as a broken attic windowpane, missing bricks, or rotten boards, could potentially be entry points. When all of the previously used and potential entry points have been found, you can then seal the points. Many entry points can be sealed using caulking or polyurethane sealant. The caulk or sealant is squeezed into the cracks, and once it dries, it will prevent the bats from getting back in. Loose siding, fascia boards, and wooden boards can be sealed using nails or bolts. For extra precaution, you could use a sealant on those as well. For areas that can’t be completely sealed, such as chimneys and vents, fine mesh plastic or metal netting can be used.